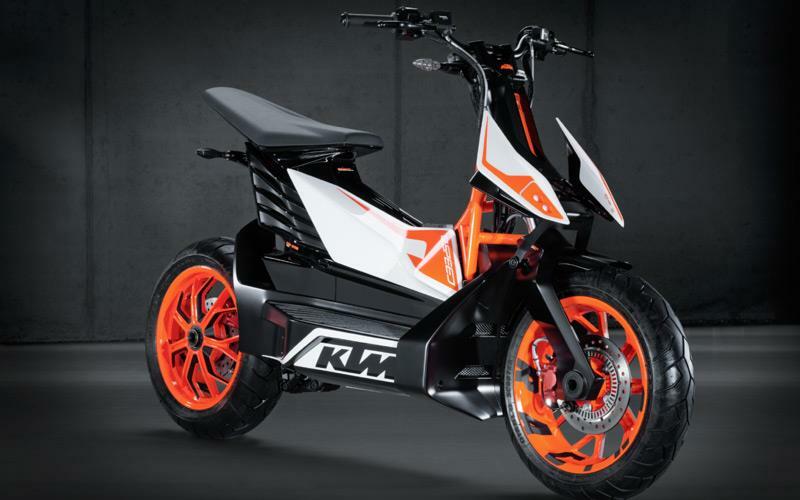 KTM has today unveiled a new electric scooter concept called the E-SPEED at the Tokyo motor show in Japan; a move that sees the Austrian firm preparing to move into a completely new market segment. The scooter concept weighs 140kg has a 50mph top speed and nearly 40mile range on a full charge and takes just two hours to full charge from a normal household socket. 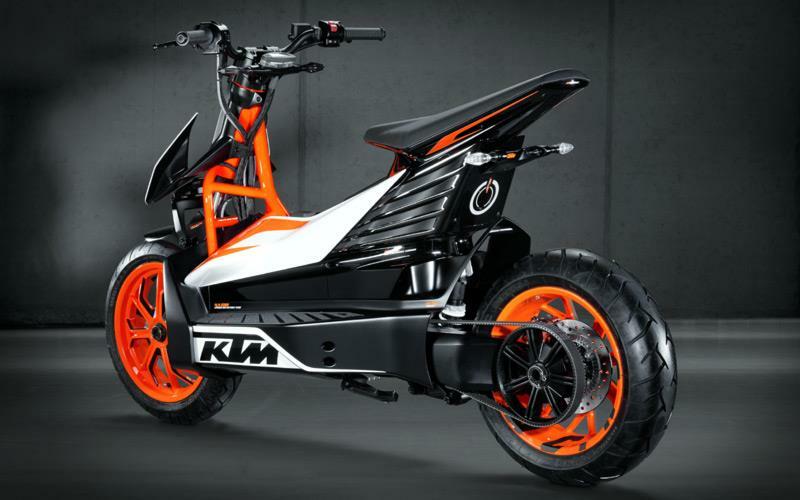 KTM’s press release reads: “The “E-SPEED” is powered by a liquid-cooled, permanent-magnet synchronous motor with 36Nm of maximum torque and a permanent power of 11kW to drive the rear wheel via a belt drive. "Electricity is stored in a package of cutting-edge lithium-ion batteries with a capacity of 4.36kWh that is fully charged within two hours on a regular 220V socket. With the powerful acceleration typical of electric motors, and with its low weight of only 140kg, the “E-SPEED” can be flicked through urban traffic with great agility, besides running nearly silently and completely free of emissions. 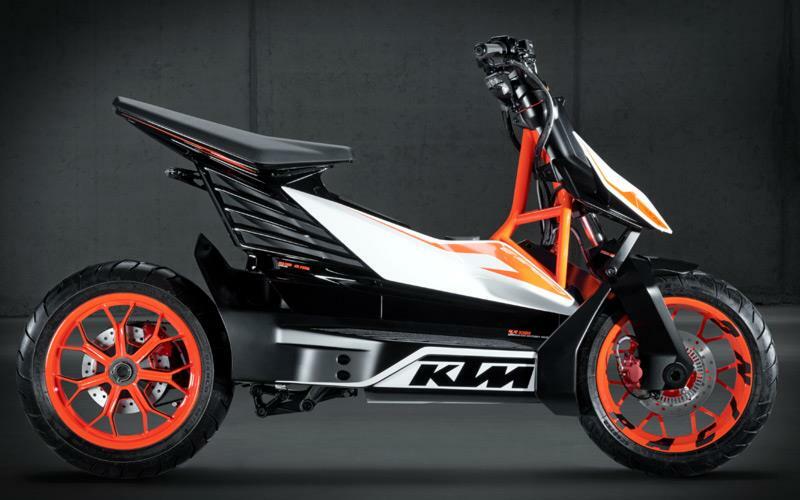 "The KTM “E-SPEED” does indeed have sporting ambitions, as witnessed by the concept’s chassis and styling – thanks to completely unique technical solutions and the inimitable lines drawn by KTM’s very own designer, Gerald Kiska. "True to his motto that each and every component of a KTM must have both an aesthetic and a structural function, the chassis and bodywork of the “E-SPEED” have turned out uncluttered and iconic with a true premium look. "Suspension and equipment have as little in common with typical scooters as the electric motor, completely encapsulated inside an aluminium casing with integrated cooling fins. The “E-SPEED” uses the aluminium battery casing as a central, load-bearing chassis component which also carries the swing-arm, the motor and a lightweight sub-frame for the front suspension. "The rear swing arm acts on the WP shock via a linkage, while the front wheel is suspended from a single-sided front fork also made by premium supplier WP Suspension. Aerodynamic polymer slats protect the rider’s feet and legs from the weather while guiding cool air toward the batteries. "Daytime running lights and the high beam use cutting-edge LED technology, while the seat rests on a lightweight but strong polymer support without any kind of metal reinforcement. 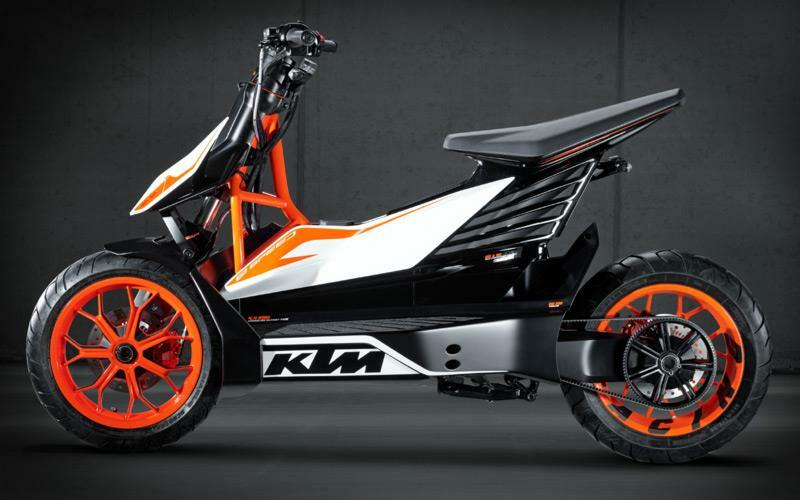 Regenerative brakes with 220mm discs, ABS, and 14-inch alloy wheels round off the ground-breaking KTM concept. “The design concept “E-SPEED" not only elevates the classic scooter concept to a new evolutionary level. 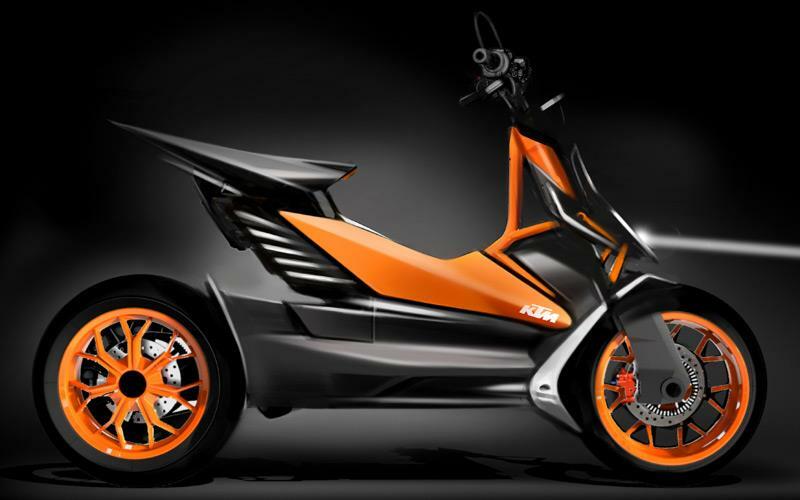 Its main purpose is to fulfil the requirements of sporty, urban mobility in a contemporary manner. 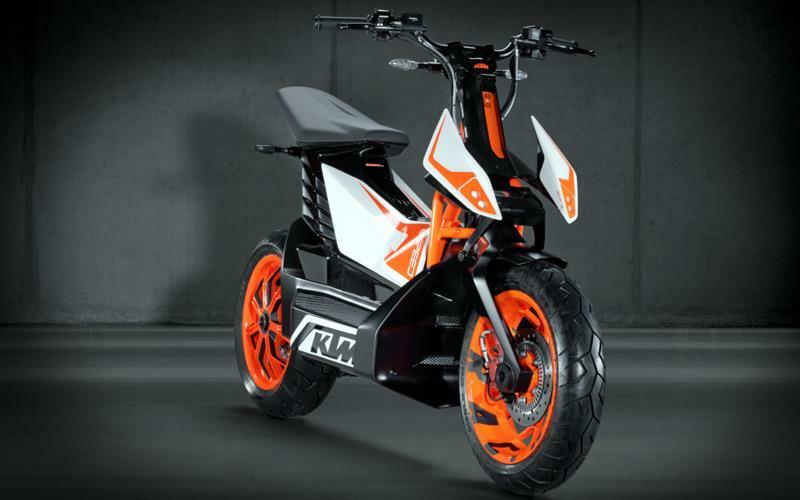 After the “Freeride-E", KTM thus once again proves that electric mobility can be combined with lightweight design, playful agility, and great riding dynamics in a single motorised two-wheeler.